Comic Book Cover of the Week!! Everyone LOVES a Grab Bag!! Geeeeezus!! I know you all must be thinking I’m so lame or got abducted by aliens or something?! Nah I have just been sooo dang busy at our new store, as we opened it officially about 10 days ago! It’s been ALOT of work and continues to be and I have been feelin’ a bit out of the loop in the nerdom real lately-well, no more I say! I’m back and gonna be hitting the blog hard again now that it’s become just a bit more manageable-So today I though the comic book cover of the week had better be festive! 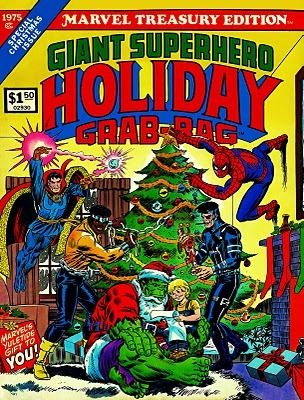 So I chose an awesome giant sized comic book cover to put you all into the holiday spirits!! Anyone remember these giant sized comic books? they were sooo awesome-infact I got a few of them for christmas as a kid and took them everywhere with me!! Here’s one of the best holiday covers! MERRY CHRISTMAS EVERYONE! !